Thread: Did Guild ever make 60's Starfires in any custom colors aside from Green/Black? EmeraldFire was not the official name for a Starfire with an Emerald Green finish; the official name was Emerald Star. If you read further down the link you included in your posting, you will see the owner's comment about the model designation on the label of his Starfire. That sputtering noise you heard was my brain farting, thanks! Therein lies the source of the problem. Do I adjust the timing so the AI has more time to read or increase the buffer so the AI remember what has been read or is there something else going on? For 60s models, I've also seen the dark sunburst with black as the outer layer, as well as a few Amber examples that surface occasionally. I seem to recall one custom order white Starfire too. 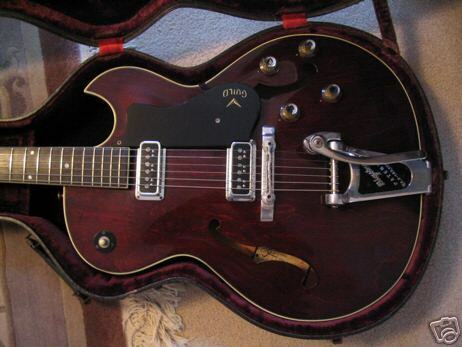 I had a 1960 SF III that was kind of plum in colour; I don't know if it was just an early iteration of cherry but it was a very different colour to my '66. Warranty expired at 25k posts and supplementary RAM is NLA in any case. Last edited by SFIV1967; 04-13-2019 at 02:38 PM. Wow. Do you know what's the story with my plum one? I seem to recall one custom order white Starfire too. Here's a 1964 white Starfire III. It was almost certainly a "Special" order. Ralf... that's a great photo that you dug up from the LTG archives with the 4 available colors in 1962/1963! Thanks for posting. Last edited by sailingshoes72; 04-14-2019 at 02:18 AM. Do you know what's the story with my plum one? What color is written on the label? I guess only Hans would know. Is it an all maple body?